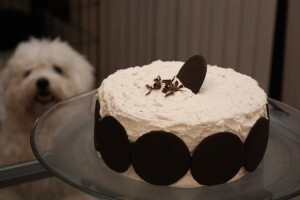 As a cookies-and-cream fan, I love icebox cake (Milo clearly does too). 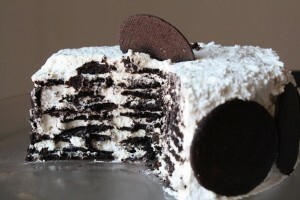 Chocolate wafers, whipped cream, chocolate curls, and . . . that’s it! What more would you want? When we visited New York after my bar exam last year, we went on an impromptu cupcake tour. My cousin Naomi recommended that we check out Billy’s Bakery, where we discovered the icebox cake. What a refreshing change from the other cupcake-dominant bakeries we visited! The Nabisco chocolate wafers aren’t easy to find, but grocery stores sometimes stock them in the ice cream aisle. 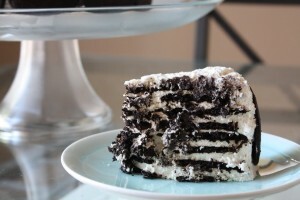 The whipped cream makes up more than half the volume of the cake, but it’s so light, and just barely sweetened, that you eat this cake up nearly guilt-free. A couple tips: 1) do not overwhip the cream (or it loses its smoothness, as it did in my case), and 2) use at least 1/4″ of cream between layers, as the wafers will soak it up and you do not want to end up with a solid mass.